The Armored Hull Boat Shield™ is a low-profile floating water barrier. Our system keeps your boat bottom free from debris & growth without the need to haul your boat out of the water! With our patented system you keep your boat’s hull looking, as well as performing, like new. Eliminate bottom growth, and minimize electrolysis while your boat is in the water! Because you won’t need to bottom paint any more, the Armored Hull Boat Shield™ system is the number #1 anti-fouling system on the market today. Works While Your Boat is Afloat! The Armored Hull Boat Shield™ and its patented Air Gate™ uses a unique system that is raised & lowered to allow your boat to enter and exit the 'pool' with ease. 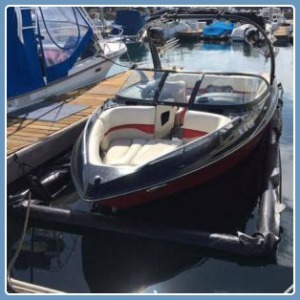 Once your boat is inside the Armored Hull Boat Shield™ and the Air Gate™ is raised to encapsulate your boat, the water in the enclosure is now self-contained. The water inside the closed Armored Hull Boat Shield™ system now has no exposure to oxygenated, nutrient rich water that bottom growth requires to sustain life. The Armored Hull Liner also acts as a great insulator from electrolysis. Boats docked inside the Armored Hull Boat Shield™ experience a huge reduction in electrolysis! There is bottom growth larvae floating in sea water. This larvae is made up of barnacles, mussels, oysters and white worm. This bottom growth larvae only survives and matures by having fresh oxygenated water that contains nutrients to feed on. The larvae attaches to just about everything in the water (dock pilings, boat hulls, drive components, rigging, etc.). Being that the Armored Hull Boat Shield™ houses your boat in its own self-contained pool of water, bottom growth cannot sustain life. The Armored Hull Boat Shield™ system also utilizes a water timer that helps neutralize the water inside the liner which contains the bottom growth microorganisms and algae. Bottom growth attaches to the liner, NOT to your boat! The Air Gate™ system releases and contains your boat in seconds. Maintain a natural, floating state where your boat is most stable. Only occasional light maintenance is required! 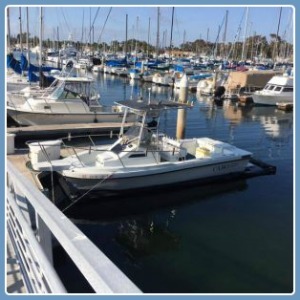 The Armored Hull Boat Shield™ is simple to install and simple to maintain, yet is extremely powerful in protecting your boat from bottom growth, excessive electrolysis, and water debris. Barnacles, bottom growth, and electrolysis can easily do permanent damage to your boat, drive unit, and transducers if your boat is left in the water for a mere two weeks. The Armored Hull Boat Shield™ protects your boat all day, every day! 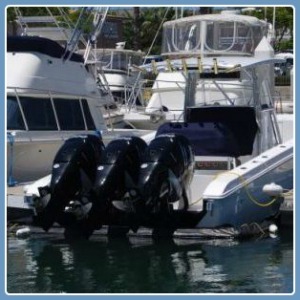 Works with many different boats including Outboards, Inboard/Outboards, Inboards, etc. The Armored Hull Boat Shield™ is built with materials that can last in saltwater for over 100 years! The distinct characteristics of the Armored Hull Boat Shield™ make this system effective in preventing bottom growth to form on your boat hull. Bottom growth will slowly form on the bottom side of the composite bottom liner material instead of on the hull of your boat. What Else Does The Armored Hull Boat Shield™ Have To Offer? People usually don’t take in to consideration that when they clean their boat with chemicals, that they are killing the environment as well. The Armored Hull Boat Shield™ will contain all cleaning chemicals that are used when you clean your boat. If you wait 24 hours before opening the Air Gate™, most of those chemicals will have evaporated from the self-contained pool of water prior to that time. Don’t you hate it when debris in the water clings to your boat? The Armored Hull Boat Shield™ will protect your shiny boat hull, trim unit, etc. from any outside debris, oil, slime, etc. from coming in contact with your boat. Have you ever dropped something in the water while your boat is docked? Perhaps your sunglasses, tools, keys? Not to worry! The Armored Hull Boat Shield™ will more than likely catch those items so you can easily retrieve them! The Armored Hull Boat Shield™ system is designed from first hand knowledge, through many years of use. We were determined to create a product that is unlike any existing boat bottom protecting system on the international market today. The Armored Hull Boat Shield™ system is built with an extremely rugged construction, making it extremely effective as well as durable in marine environments. Armored Hull Boat Shields™ are easy to assemble and service. Durability, Longevity, Ease Of Service, Low Cost, and Functionality are highlights of what you can expect when using the Armored Hull Boat Shields™ System. Want To learn Even More About The Armored Hull Boat Shield™ System? Simply contact us for more info. Click on the "ARROWS" below to see the Armored Hull Boat Shield™ with the patented Air Gate™ in action and see just how easy it is to start protecting your investment today! CLICK ON THE "ARROW" BELOW to see how easy it is to lower the patented Air Gate™, allowing you access to the Armored Hull Boat Shield™. CLICK ON THE "ARROW" BELOW to see how easy it is to enter the Armored Hull Boat Shield™ with the patented Air Gate™ in the lowered position. CLICK ON THE "ARROW" BELOW to see our patented Air Gate™ in action! Give us a call and start protecting your investment today! Questions? Please feel free to contact us by clicking on the Armored Hull™ logo.